Our Diving Gas Control Panels and Skids utilise Hale Hamilton's experience Pressure Control and the handling of Helium and Oxygen Mixtures. Components: All Valves and Pressure Controllers used are specified as appropriate for service on Oxygen, Heliox and the various Therapeutic mixtures often used in Diving Gas Systems. 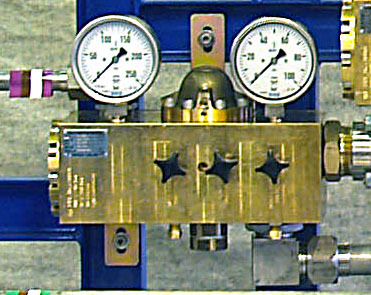 All Valves and Pressure Controllers used on Oxygen and Oxidising Gases carry an Adiabatic Shock Test approval from CTE or BAM. Manifolds: Hale Hamilton often prefer to use manifolded valve configurations (see below) to reduce piping and costly associated fabrication & testing. 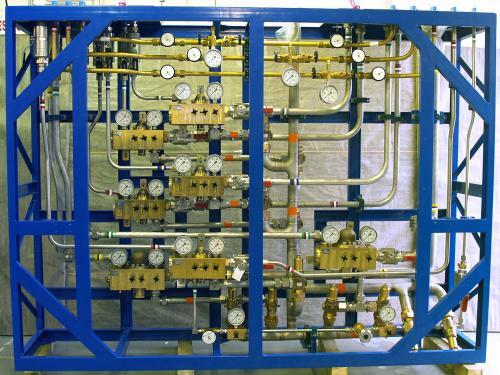 Our Pressure Reduction Manifolds simplify the skid layout, reduce cost promote easier servicing. Project subject to DNV approval.